We all yearn for regular, meaningful communication with our Father in Heaven. And because he knows and loves us perfectly, he has provided an amazing vehicle by which we can converse with him, a means by which we can tap the deepest wellsprings of his knowledge, comfort, strength, and love. That divine process is prayer, and it can make all the difference in our lives. As author Robert L. Millet observes, "Rewarding prayer is more than ritual an repetition. It is heartfelt, substantive, the very doorway to pure religion." In his insightful way, Brother Millet helps us understand the true nature of prayer and its power to refine us and bind us to the Source of all blessings. From preparing for this sacred communion, to having faith that our prayers will be answered, to what to do when we don't feel like praying or when no clear answer comes, to following the admonition to pray always, we find here inspiring direction for exercising the sacred privilege of prayer. Learning and applying the principles of effective prayer can bring to our conversations with God a new understanding and a welcome infusion of the Spirit. Brother Millet's humble testimony of these sacred interactions is a compassionate invitation to us to take full advantage of this divine gift. Why do bad things happen to us? Why is there so much pain and suffering in the world? And how can we have peace in a time of turmoil? 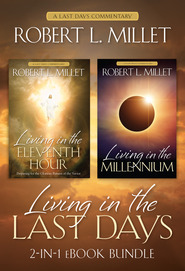 Robert L. Millet helps us find timely answers to these timeless questions by focusing our attention on the beauty and power of the gospel of Jesus Christ. the importance of reading the signs of the times while remaining sane and balanced in living the gospel. Filled with insights from the prophets, both ancient and modern, and further brought to life with personal examples, I Will Fear No Evil is a timely and thoughtful book to calm our fears and sustain our faith in times of distress. Although our world often seems locked in a downward spiral, we can find reassurance in the prophetic promise that this era of turmoil, strife, and war can also be a time of growth, unity, and peace. And we can take comfort in the words of the twenty-third Psalm: 'Though I walk through the valley of the shadow of death, I will fear no evil: for [God is] with me' (v. 4). Robert L. Millet points out in this very readable book that "each of us, at one time or another, wrestles with what life is all about and what it takes to be content." "It is sobering," he continues, "that someone can possess the fullness of the gospel . . . and still feel empty and unsatisfied." Millet, professor of ancient scripture and former dean of religious education at BYU, examines the ongoing conversion process in climbing the "mountain of spirituality." Robert L. Millet outlines those things that can contribute to or detract from our efforts to develop spiritual maturity. He examines the human condition and concedes that none of us can do it all. The book emphasizes that hope is found in Jesus Christ, whose atonement remedies all of our deficiencies- physical, emotional, and spiritual. It discusses dealing with difficult doctrinal questions, avoiding gospel hobbies, developing a true testimony and sharing it, and building our lives upon Jesus Christ.